An unfortunate consequence of living in sunny South Africa is that we deal with a lot of parasite-borne diseases. Piroplasmosis is often referred to as “tick bite fever” or “biliary”. It is important to note that piroplasmosis is a blanket term which encompasses infection by either the Babesia or Theileria protozoan (a protozoan is a single-celled, microscopic organism – it is this organism which causes the disease). It affects horses, donkeys and zebra. 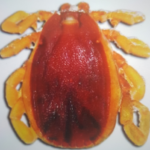 The Babesia (more specifically known as Babesia caballi) protozoan causes a form of piroplasmosis known as Babesiosis and is transmitted by two different types of ticks. These are known as the “red-legged tick” (Rhipicephalus evertsi evertsi) and the “small smooth bont-legged tick” (Hyalomma truncatum). 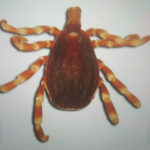 The Theileria protozoan causes a form of piroplasmosis known as Theileriosis and is transmitted by the red-legged tick (Rhipicephalus evertsi evertsi). 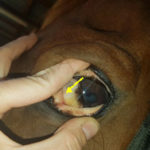 It is important to note that the disease may also be transmitted in utero from the mare to her foal and may cause abortions or the birth of an infected foal. Both tick species are active mainly during the warm, wet summer months but will often be present in varied numbers throughout the year. It is important to note that another way that piroplasmosis may be transmitted is through contamination of infected blood; this could occur by re-using needles or using instruments which have not been properly cleaned and sterilised. Another possible mechanism of infection is by performing a blood transfusion from an infected horse – for this reason; blood donor horses should be regularly monitored to ensure that they are free of the disease. 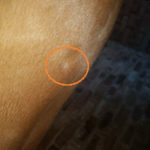 From when the tick bites your horse, the incubation period until the horse displays the first signs of infection are variable. With Babesiosis the incubation period ranges from 10 to 30 days and with Theileriosis, the average is a bit shorter at 12 to 19 days. Horses may remain subclinical carriers of the infection and may become carriers after disease has occurred and the horse has been treated. One of the problems with correctly identifying piroplasmosis infection is due to the fact that the symptoms are largely vague and non-specific. In South Africa, however, it should always be higher on the list of possibilities when assessing possible cases of infection. This means the disease was very severe and often results in horses being found dead. in more advanced or severe cases, oedema may develop. This oedema is present on the underside of the belly. Oedema means that fluid has leaked out of the circulatory system and has collected within the surrounding tissues. Right above: circled is an area of oedema which has been indented with a fingertip and this stays indented for a small while before returning to normal. This is known as “pitting oedema”. In order to diagnose the piroplasmosis, your veterinarian will assess all the symptoms together with the findings of their clinical examination, and a basic evaluation of the haematological findings of the horse. A blood sample can also be sent for CELISA (competitive enzyme-linked immunosorbent assay) or IFAT (indirect fluorescent antibody testing). The IFAT testing is frequently required when horses are being exported internationally. Once piroplasmosis has been positively diagnosed in a horse, treatment should begin. 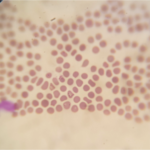 It is important to note that treatment for Piroplasmosis is NOT benign and as such, it should ONLY be reserved for use where a positive case has been identified. 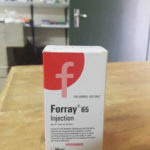 The medication which is recommended (Imidocarb diproprionate) can be toxic to the kidneys, this is especially a concern if the horse is dehydrated or if there is the presence of blood in the urine which already indicates stress upon the kidney. Horses may also colic after treatment; this is prevented by the administration of gut relaxing/pain relieving medication prior to the administration of treatment. Horses generally respond well to treatment and repeat treatments are rarely required. It is important that the horse’s overall habitus and clinical parameters should show improvement, as well as an improvement in the horse’s blood profile, more specifically in the haematocrit level of the blood. Haematocrit is the value which describes the ratio of the volume of red blood cells to the total volume of blood. If the haematocrit level reaches a critically low point, blood transfusions should be considered – this usually occurs at a haematocrit value of 12 and below. On the left are two haematocrit tubes on which a manual haematocrit has been performed at the clinic. 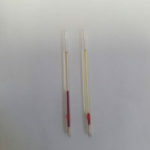 The tube on the left is from a healthy, fit racehorse which had a haematocrit of 44. On the right, is the haematocrit of a horse which had Babesiosis. The difference is notable. 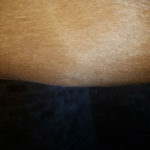 This horse had a haematocrit of 14 and was becoming a borderline candidate for blood transfusion.